I started with examples. The toddler “cleaned” her room. During our flight to Ecuador, we were served “dinner.” I have been “training” for the marathon. We talked about how quotes around words and phrases are a signal that we don’t exactly mean what we are saying. Maybe it is an incompleteness, or diet version of the meaning. He caught on quickly. “You mean something like my mom is quote/unquote smart?” Har, har, har. I will save the convo about trying to avoid such speaking and writing tics for another day. 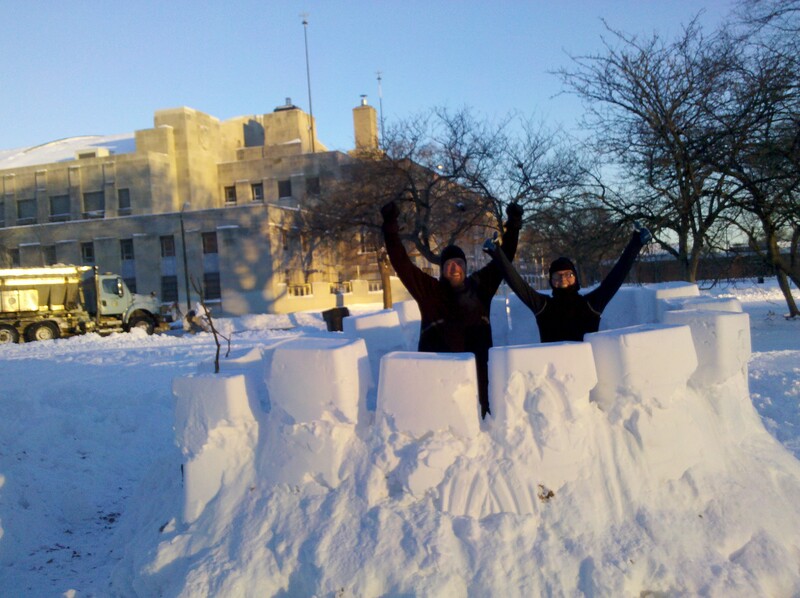 We found this castle on an early morning run through Humboldt Park, and gave thanks to the snow plow that cleared the park roads quickly. I put the title of this post in quotes, because I am not putting a whole lot of stock in my little chart of race performances in the last few years. There are many variables besides experience and level of training influencing those paces (including race distance). The Sedona 10K in March, 2011 was hot, had an incline, and was at altitude–not something you can train for in Chicago. But running with Karen through single digit temps and double digit snow falls that winter prepared us well enough, and pulled me through some of the darkest periods of my life. Although my pace for that race slightly interrupts the overall downward trend in the 10Ks I have run, it represents some of the most disciplined and challenging training I have done. But I also like pulling the numbers together; memory and gut checks are not always reliable, and slicing and dicing even small datasets can reveal tidbits. I did not realize how many races I have done (no wonder I have so many darn shirts!) or that most have been 10ks. Those paces have trended gently down, which makes me optimistic about improving at a particular distance over time. 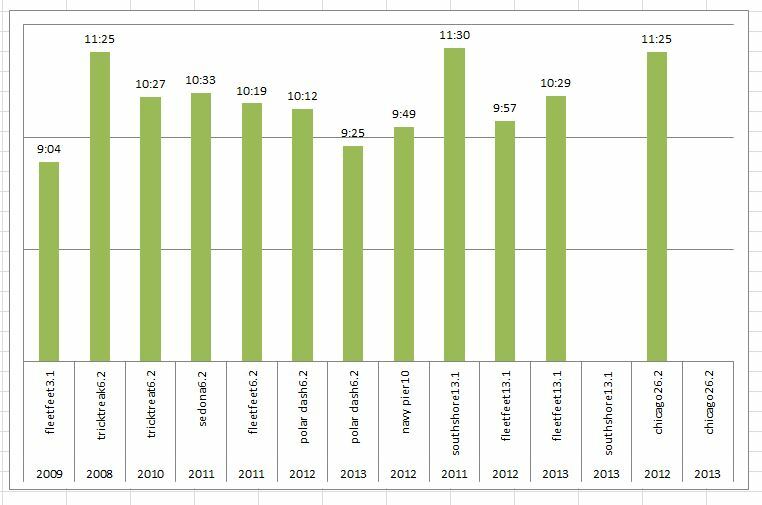 In 2012, leading up to and right after the marathon, I started getting into the 9 territory, but my pacing in the longer races was slower, understandably. I would like to consistently perform below 10 for all distances. But, mostly I have to survive the next two races. I botched the last half marathon b/c I went out too fast and hit the wall. Bad race strategy. Going for negative splits this Sunday, and not worrying too much about overall pace. I can always put an asterisk on that column about why I was under-prepared. Excuses, excuses!